Emmet County Sheriff Office’s Sgt. Rich Bankey was recently recognized by the Women’s Resource Center of Northern Michigan (WRCNM) for his efforts in handling domestic abuse cases. His work earned him the group’s annual Excellence in Service Award. Follow the link to read WRCNM’s news release on why they chose Sgt. Bankey for this year’s award – http://www.wrcnm.org/news-a-events/wrcnm-news/entry/sgt-bankey-of-emmet-county-sheriff-s-office-recognized. Petoskey Public Safety Lieutenant Todd Troxel received the Excellence in Service Award presented by the Women’s Resource Center of Northern Michigan (WRCNM) to recognize his work in promoting domestic violence victim safety and offender accountability. Also pictured are Emmet County Prosecutor’s Office representatives (from left) James R. Linderman, Prosecutor; Marie Coleman, Victim Witness Coordinator; Troxel; Chris Krajewski, WRCNM Domestic Abuse and Sexual Assault Program Director; and Mike Schuitema, Assistant Prosecutor. Some of the words colleagues use to describe Petoskey Public Safety Lieutenant Todd Troxel are reliable, compassionate and hardworking. Troxel earned the Emmet County 2017 Excellence in Service Award for his work responding to and investigating domestic abuse cases. 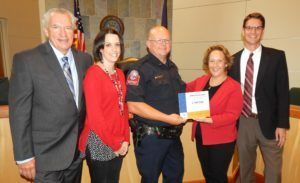 Women’s Resource Center of Northern Michigan (WRCNM) recognizes law enforcement officers with the award in the five counties they serve as part of October’s Domestic Abuse Awareness Month. Additional praise for Troxel’s work came from Petoskey Public Safety Director, Matt Breed. “Lt. Troxel is a very caring, compassionate officer that has the ability to assess a complicated, often times, volatile situation and come up with a plan to ensure the safety and well-being of all those involved,” explained Breed. Marie Coleman is the Victim Witness Coordinator with the Emmet County Prosecutor’s Office where she has become acquainted with Troxel’s work ethic. “I have truly appreciated working with Lt. Troxel,” said Coleman. “He is so reliable and someone you can count on in a pinch. I’m very grateful crime victims have a responsible and caring officer that goes above and beyond,” said Coleman. WRCNM Domestic Abuse and Sexual Assault Program Director, Chris Krajewski describes Troxel as a community asset. “He is professional and compassionate. He recognizes the importance of collaboration within agencies to work towards the safest response for victims of domestic violence. 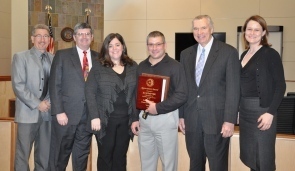 He is very deserving of this Excellence Award,” said Krajewski. Those receiving awards were selected by WRCNM counselor/advocates who provide support services and advocacy for domestic abuse survivors and work in conjunction with law enforcement in Antrim, Charlevoix, Cheboygan, Emmet and Otsego counties. Other honorees for 2017 are: Sheriff Daniel S. Bean, Antrim County Sheriff’s Department; Terrence McDonnell, East Jordan Police Chief; Deputy Darren LaChapelle, Cheboygan County Sheriff’s Office; and Deputy James Fox, Otsego County Sheriff’s Office. (March 2016) Emmet County Prosecutor Jim Linderman has announced the hiring of Michael Schuitema as an Assistant Prosecuting Attorney. Schuitema, 34, joined the staff on Monday, March 28. He moved to Petoskey from Grand Rapids after holding prosecuting and state investigative positions in Florida and Michigan. Schuitema is a Hudsonville, Mich., native. He attended Unity Christian High School and then Calvin College, from where he graduated in 2004 with degrees in business and political science. He attended law school at the University of Virginia, graduating in 2007. After graduation he spent five years as a prosecutor in the Lakeland, Florida area, serving the three-county 10th Judicial Circuit. In 2009, he returned to Michigan as the prosecutor for Huron County, working from the county seat in Bad Axe. In 2011, he accepted the prosecutor’s position in Kent County where he served for a year before taking a job in Lansing to work in the State Inspector General’s Office of the Department of Health and Human Services, investigating Medicaid fraud by medical providers. He worked for the state until accepting the position in Emmet County. As one of four Assistant Prosecuting Attorneys in the local office, Schuitema will focus on cases involving assaults, domestic violence and financial crimes, both misdemeanors and felonies. Brand new to the area, Schuitema said he’s been impressed with the friendliness of the people he’s encountered at work and in the community and he especially enjoys the views of Little Traverse Bay. “I am really looking forward to golfing and getting out on the water this summer,” he added. Schuitema’s wife, Andrea, is a school teacher and will be joining him in Petoskey after the school year ends in June. They have a 2-year-old daughter, Dylan. 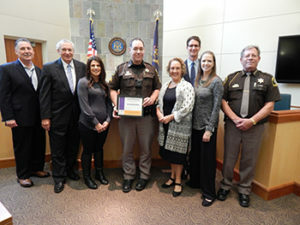 Photo caption: Emmet County Sheriff’s Office Det/Sgt JL Sumpter (center, holding plaque) was given an Award of Excellence from Emmet County Prosecutor Jim Linderman (second from right). Also on hand for the brief ceremony were members of the Prosecuting Attorney’s staff, from left: Stuart Fenton, Chief Assistant Prosecuting Attorney; Mike McNamara, Assistant Prosecutor; Angela Lasher, Assistant Prosecutor; Sumpter; Linderman; and Kayla Nixon, Assistant Prosecutor. (Dec. 19, 2014) — Emmet County Prosecutor Jim Linderman has presented Emmet County Sheriff Detective/Sergeant JL Sumpter with an “Award of Excellence” as Sumpter prepares to retire from the department in January 2015. In bestowing the honor on Sumpter, Linderman noted numerous examples throughout Sumpter’s career, including his extensive and unrelenting investigation in the high-profile murder case of Carol Kopenkoskey, resulting in her conviction for murder in the shooting death of her husband, Lyle. Linderman also highlighted Sumpter’s hard work and tenacity in the murder investigation of Trenton Mallory and for his dedication and commitment to the pursuit of justice in that case, which recently resulted in a first-degree murder conviction of Amber Smith. Additionally, Linderman offered praised for Sumpter’s work in the Loesch child abuse case, assuring that justice was carried out in the mistreatment and horrific conditions that two young children endured. “Likewise, we recognize his work in obtaining justice in the Venchenko child abuse case in which an infant suffered a broken leg at the Defendant’s hands, and thanks to JL’s skills he was able to obtain a confession in the case,” Linderman added. Sumpter’s official retirement date is Dec. 31, 2014, though his last day in the office was Dec. 19, 2014. He joined the Emmet County Sheriff’s Office for the first time in October 1995. In 2000, he left to work in the private sector and was later rehired by the sheriff’s office in August 2001 as a road patrol deputy. In 2005, Sumpter was promoted to a temporary detective/corporal position in July. In 2006, he was made a permanent detective/corporal and in August 2009 he was promoted to Detective/Sergeant, a position he has held until his retirement this year. At age 42, Sumpter plans to begin a career with his wife, Courtney Angell Sumpter at Northern Michigan Equine Therapy. “We are a nonprofit therapeutic riding facility where we utilize a horse as the primary tool for children and adults with disabilities. We are also very excited to introduce an at-risk youth program in the near future,” Sumpter said. He also has his own freelance copywriting business where he generates marketing material for various companies. Sheriff Pete Wallin also recognized Sumpter’s service to the citizens of Northwest Michigan. “I want to thank him for his years of service to this office and the citizens of Emmet County,” said Wallin.